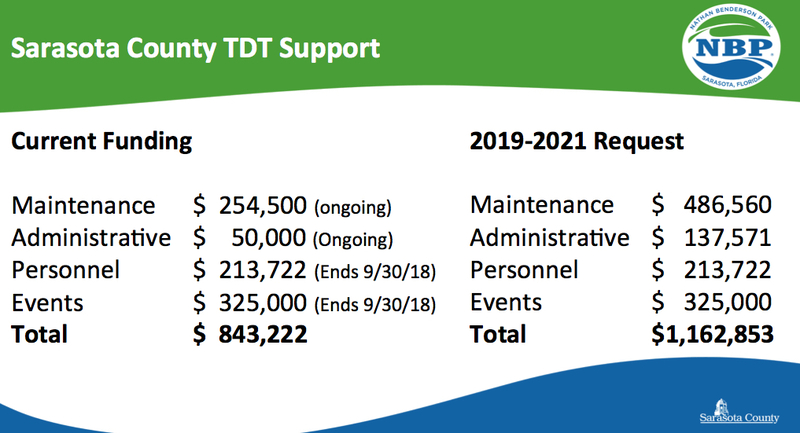 At the recommendation county staff, the Sarasota County Commission has agreed to give the Suncoast Aquatic Nature Center Associates (SANCA) $858,353 in additional funding for the 2019 fiscal year to assist with paying for personnel and events — plus rising routine expenses — at Nathan Benderson Park. However, the board members voted unanimously on June 20 to direct County Administrator Jonathan Lewis to work with the county’s Parks, Recreation and Natural Resources (PRNR) Department staff and SANCA’s staff in “sorting out a new agreement that’s fair to both sides,” as Chair Nancy Detert put it. The commissioners suggested that their staff and SANCA representatives consider a host of possibilities for generating extra revenue — from T-shirt sales to charging more for parking during events to dining options. “The No. 1 beach in the world has a food concession,” Commissioner Alan Maio pointed out, referring to Siesta Public Beach. 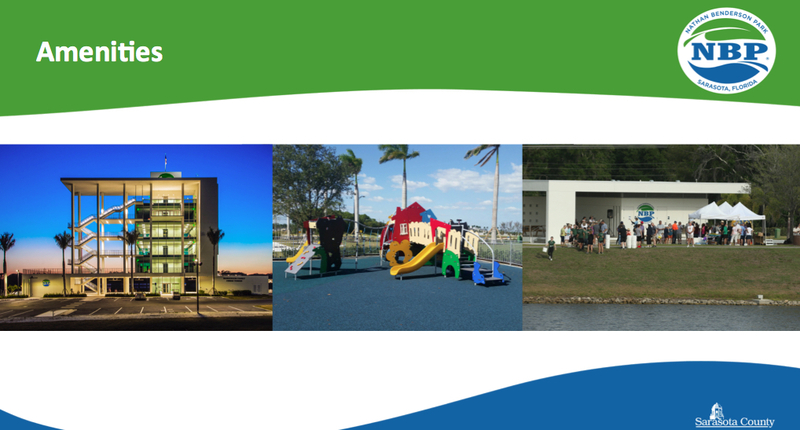 SANCA manages Benderson Park for the county. In response to a question from Hines early on in the discussion, Brown said, “We did a quick, high-level analysis … and it would indeed cost the county more to take on the full responsibility” of the work SANCA handles. Both Brown and Rodriguez explained to the board that, under the terms of a July 12, 2016 amendment to the county’s agreement with SANCA, the county’s annual budget support rose to $843,222 through the end of the current fiscal year — Sept. 30. As of Oct. 1, the county no longer would pay for personnel and event expenses for SANCA. However, she continued, SANCA had submitted a request to increase the current annual funding level by $319,631 per year from FY19 through FY21. Brown noted that, because of the addition of a number of amenities in recent years — for example, the Finish Tower, a children’s playground, a wave attenuator, three sets of restrooms and a Starter’s Pavilion — the cost of maintenance has increased at the park. Additionally, she told the commissioners, SANCA staff has pointed to higher bills for a variety of services, including janitorial work; water, electric and sewer service; internet access; landscaping; and window washing. Detert noted the Finish Tower’s glass façade in response to the inclusion of “window washing” in Brown’s list. “The park’s use has increased,” Rodriguez pointed out, which also has elevated maintenance expenses. Rodriguez reminded the commissioners that SANCA is a 501(c)(3) nonprofit. “We exist really for the purpose of operating this Sarasota County asset, he added, referring to the park. After Rodriguez noted the amount of money the county has been providing SANCA for personnel and events each year — $538,722 — Detert asked him who would be leaving his staff and what events would have to be eliminated if the County Commission chose not to continue funding those expenses. “We would have to make some serious decisions on how to properly staff the park,” he replied. For example, he added, the Florida Scholastic Rowing Association (FSRA) Sculling and Sweep championships and the USRowing Youth National Championships events would have to cease. Rodriguez stressed that the county funding support is not in the form of “a blank check. It’s actually all reimbursements,” which have been itemized and approved by county staff. Rodriguez also provided statistics about the park events’ contributions to county and state coffers. Over the past three-and-a-half fiscal years, he said, the overall economic impact has been $108 million, including the approximately $22 million statewide that was generated by the 2017 World Rowing Championships. 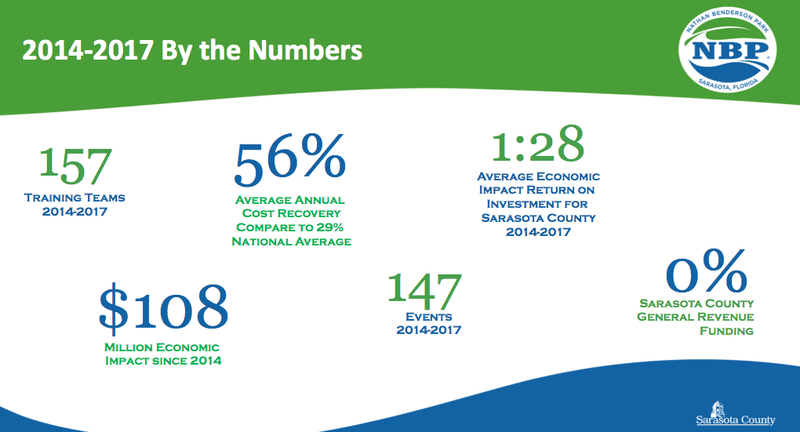 The average return on investment for Sarasota County has been 1:28, he added. 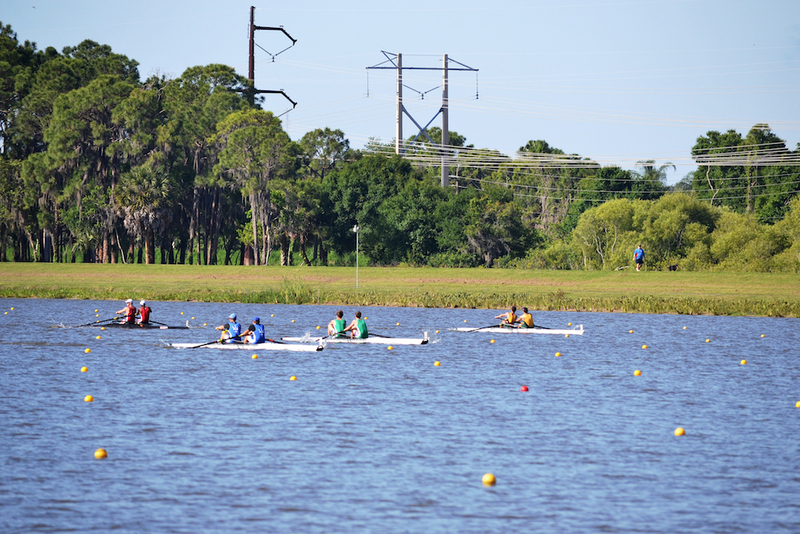 From 2014 through 2017, Rodriguez said, Benderson Park hosted 147 events, and 157 rowing teams trained there. 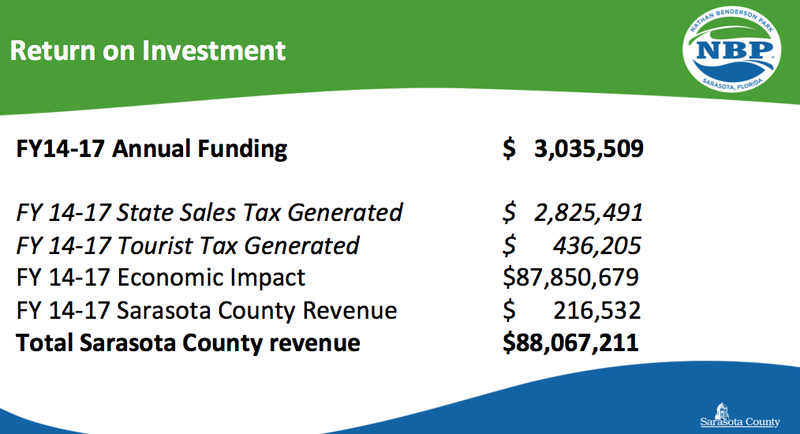 For the same period, he pointed out, the county provided SANCA $3,035,509, and the nonprofit generated $88,067,211 through state sales tax receipts, Tourist Development Tax revenue and other county revenue, as well as overall economic impact. The figure does not include the World Rowing Championships’ financial return, he added. Among major events coming up, Rodriguez continued, are the USRowing Youth Nationals for 2019 through 2021 and the NCAA Women’s Rowing Championships for Divisions I, II and II in 2020 and 2021. Staff also is working on a contract for the FSRA Sculling and Sweeps events for 2019 through 2021, he said. Those upcoming competitions illustrate “the importance of our three-year ask,” he told the board. Detert also asked whether the county pays to have events at the park or whether the organizers of those events pay the county. “It varies,” he replied to the latter query. “You’re going to make your money from the national and regional events,” he added. “I’d just like to see something that says ‘revenue’ that isn’t government money coming your way,” Detert responded. “Going forward, the boathouse was supposed to be there and generate income,” Commissioner Hines pointed out, referring to park plans long touted by the original SANCA CEO, Paul Blackketter. The boathouse was not only supposed to serve as a storage facility for rowing equipment, but it also was to be designed as a venue that could be rented for a wide array of community events. Additionally, the Nathan Benderson Community Park Foundation members “were supposed to be raising money, have promised in the past [that they would provide] matching funds, and I’ve never seen any of those funds,” Detert said. “I can’t speak on behalf of the Foundation,” Rodriguez responded. “We’re always criticized for the name that’s on this park, unfairly,” Hines pointed out. Commissioner Maio concurred with Hines. Nathan Benderson was the founder of Benderson Development Co., which was a partner in the development of the nearby Mall at University Town Center; it has built other shopping centers in the immediate area. 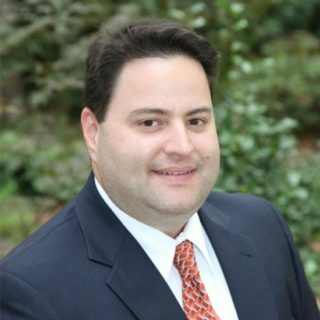 Randy Benderson, son of Nathan Benderson and CEO of Benderson Development, is one of the Foundation board members. Moran, though, did note the importance of having “a clear measurable business plan” that the commissioners can show the taxpayers, so the latter will know how their money is being used in the park. County Administrator Jonathan Lewis agreed. “I think a realistic plan on the go-forward is critical.” That was why staff had recommended the additional funding be provided to SANCA just for one more year, Lewis added. He is not certain, he said, whether the boathouse should be a facet of the future business plan. “The realistic outlook is important [so] you guys can make the business decisions,” Lewis told the commissioners.